With the AC Output superimposed on + 200 V DC and used as a modulated polarization voltage on a standard measurement microphone such as the GRAS 40BP, the microphone becomes a precison soundsource for generating high frequency acoustic signals. Alternatively, the AC Output alone can be similarly used with a prepolarized microphone such as the GRAS 40AD. With the AC Output superimposed on + 800 V DC, it can be used as a modulated polarization voltage for electrostatic actuators, e.g. 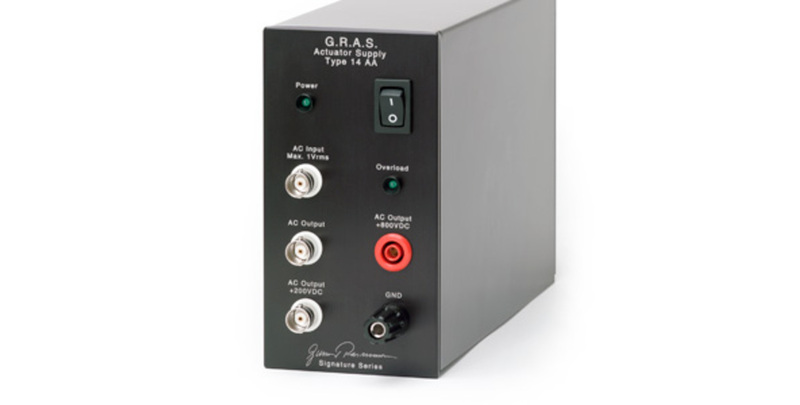 the GRAS RA0014 or RA0015, for measuring the pressure frequency response of condenser microphones. The data sheet shows an example of a set up using this technique for accurately measuring the pressure frequency response of a condenser microphone in the range 100 Hz to 200 kHz. Care should be taken when calibrating below 200 Hz because of the influence of pressure equalisation in the rear volume of the microphone. All GRAS products are made of high-quality materials that will ensure life-long stability and robustness. The 14AA is delivered with a 2-year warranty. Damaged diaphragms in microphones can be replaced. The warranty does not cover products that are damaged due to negligent use, an incorrect power supply, or an incorrect connection to the equipment. All repairs are made at GRAS International Support Center located in Denmark. Our Support Center is equipped with the newest test equipment and staffed with dedicated and highly skilled engineers. Upon request, we make cost estimates based on fixed repair categories. If a product covered by warranty is sent for service, it is repaired free of charge, unless the damage is the result of negligent use or other violations of the warranty. All repairs are delivered with a service report.